The fact is that conflicts are more likely to occur among condominium homeowners, who generally live in close proximity to one another, share ownership of common elements, and are subject to stricter-than-usual limits on their property rights, than those who live in traditional single-family homes. Acknowledging this, the State of Florida requires that all condominium associations have a provision for “mandatory nonbinding arbitration” in their bylaws so that disputes are settled relatively quickly and amicably—without costly, time-consuming litigation that is likely to increase ill will among residents. This course teaches condominium residents the procedures to follow when using different methods of alternative dispute resolution (ADR), including negotiation, mediation, and arbitration. Statutory guidelines are explained and procedures are outlined for the different methods of ADR. Learners acquire the knowledge needed to achieve satisfactory resolutions to all types of disputes originating from condominium ownership (Discounts are available for Condominium Boards or Property Management Companies by calling us at 1-800-521-9667). 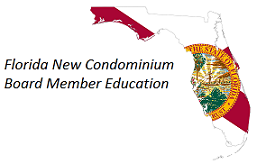 To instruct Directors, Officers, Managers, and members of condominium associations in the effective use of alternative dispute resolution techniques to settle conflicts among condominium residents in a manner consistent with the regulations enumerated in Florida's Condominium Act and the Florida Administrative Code. apply the rules outlined in Florida’s Condominium Act and the Florida Administrative Code that relate to using ADR to resolve condominium conflicts. This course (# 9626084) has been approved for 2.0 hours of continuing education credit in the areas of HR or ELECTIVES (ONLINE) by the Regulatory Council of Community Association Managers of the Florida Department of Business and Professional Regulation. For more information about continuing education for Community Association Managers, visit the Regulatory Council's homepage.